Each winter, the skies above Brighton’s shores fill with thousands of migrating starlings as they return to warmer climes. Floating on the horizon like a distant rain cloud, the giant flock of birds sweep majestically into synchronised movement, a natural phenomenon known as a murmuration. Also the title of Rinko Kawauchi’s first UK commission in 2010, it’s a word that tumbles off your tongue, spilling out softly across your lips. A gentle, whispered, fluttering rumble. If such musings of a simple word seem slightly excessive in sentimentality, it’s only because Kawauchi’s work is so perfectly fine-tuned for such a reaction. Her images are some of the most recognisable in the contemporary photography arena; hundreds of strangely perplexing, dreamy shots – globules of jellied fish eggs, glistening watermelon flesh, rippling water dappled with sunlight – all muted and faded in a rose-tinted beauty. And then there’s the tumbling echo of the word itself, “murmuration,” putting a simple sound to Kawauchi’s soft, hazy visual, never quite sure of where it came from or where it’s going. Haloed by a fragile mist, her images seem to be more than just objects of representation. They appear instead like the hazy fabric of memory itself, as she elegantly weaves into them the act of remembrance that inhabits photography. Perhaps this is an extension of what John Szarkowski’s referred to, when in 1974 he claimed “immediate experience” to be at the heart of Japanese photography of the previous decade. Rather than merely a comment on experience, he believed these images to be a “surrogate for experience itself.” Moving back and forth between imagination and reality, past and present, Kawauchi’s romanticised images reveal the manipulation and artful refining with which both memories and photographs emerge. 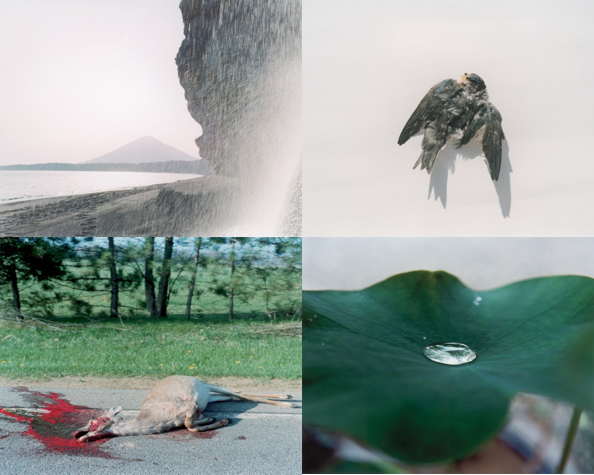 Kawauchi herself has explained how the editing of her work is as important to the final image as taking the photograph itself, even presenting many alongside her own haiku poetry. This then really is life transformed into art, the transformative element becoming a focal point of its own. Images that might ordinarily make us uncomfortable are captured unflinchingly, draped with the same grace and lightness of her most conventionally beautiful images. The blood-splattered carcass of a deer, a bag of fleshy pulp and animal eyes from a butcher, a large spindly spider, a body dotted with swarming giant ants, all interlaced with pretty pink flowers and glistening morning dew drops. 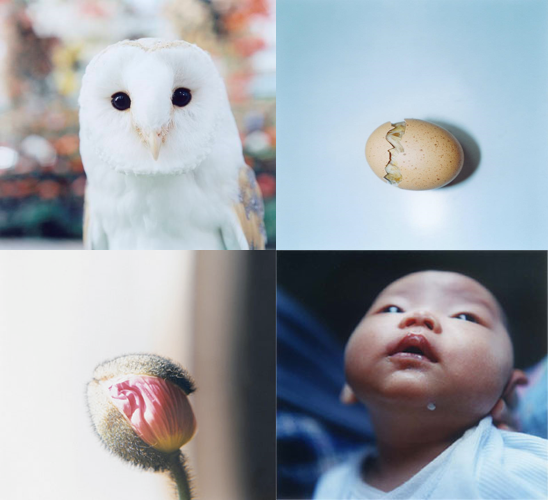 Viewers of Kawauchi’s work are confronted with a longing – one for the world to really look this way, for our memories to be this sweet and simple. She reminds us to take a second look to the world around us. Perhaps we don’t need to seek out the rare phenomenon that takes place in the skies. We can look instead to the little details around us, and find just as much beauty awaiting us there.